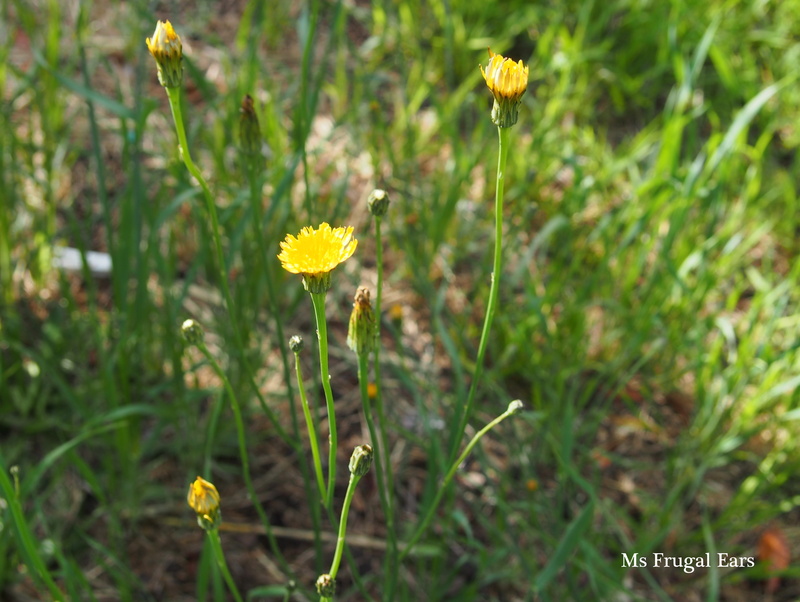 In early spring, when the first dandelions start to unbud their bright yellow flowers, what do you see? Do you worry about the gardening you haven’t done and get out the weed spray? Do you pick dandelions with your kids? Are you happy when you see the beaming heads of dandelions waving on the nature strips as you drive past? Do you just not see them at all? Or do you see FOOD. 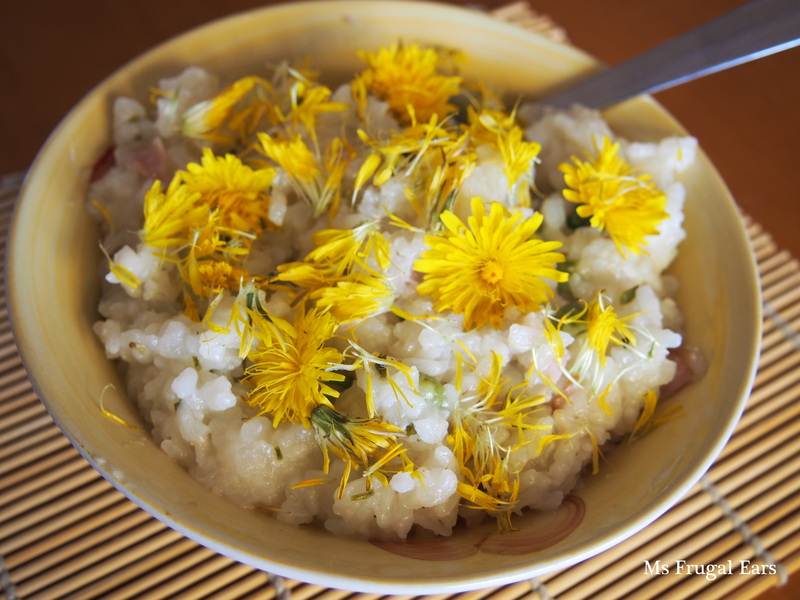 Dandelions are one of the healthiest superfoods around. They are incredibly good for you, in particular they have detoxifying properties that are good for your liver and some extremely good cancer fighting properties. The best time to eat the leaves is very early spring while they are green and tender – once they flower they become bitter. But there is nothing to stop you from eating the flowers themselves. This is a simple risotto dish. There is nothing too fancy about it other than the dandelion topping. 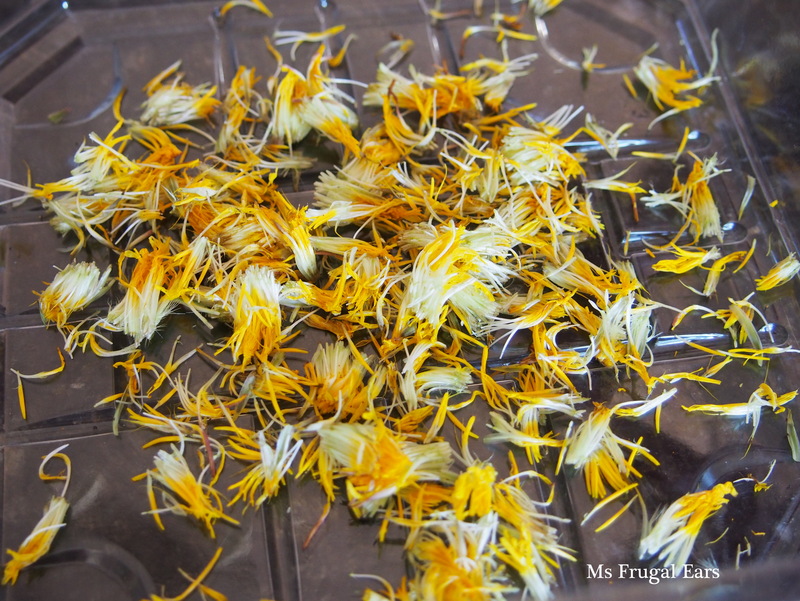 You could omit the golden petals, but they are so pretty and just that little bit special. It also adds a faint nutty taste to the dish; it is subtle and not overpowering. I made my risotto with ham, but I usually make it with chicken and when I did my costings I found it much more cost effective to do it that way. When the chicken has cooled, remove the skin and chop into small pieces. Set aside. Melt the remaining butter in a large, heavy saucepan. Chop the onion and add to the melted butter. Fry until translucent, then add the rice. Cook for a around a minute. Add the chicken, then pour over the wine. 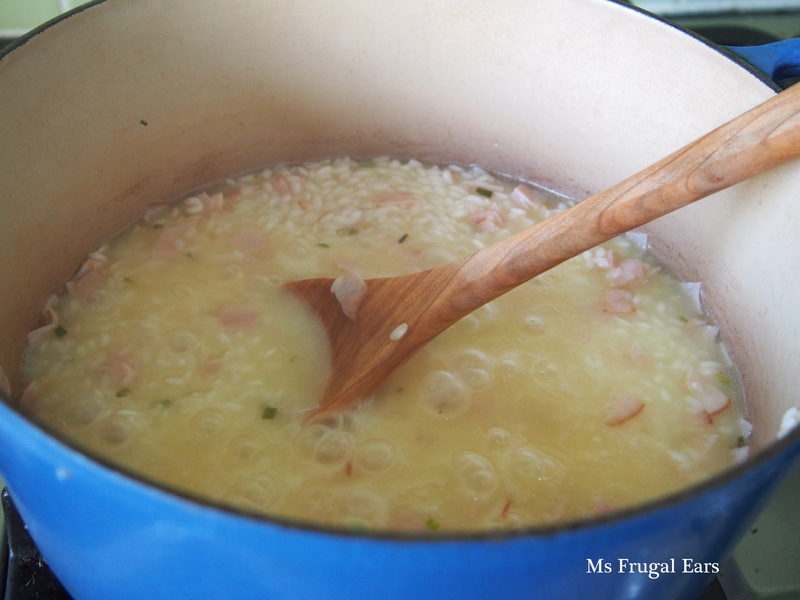 Gradually add ladels of hot soup liquid into the risotto until it is cooked. When the rice is nearly cooked add the shelled peas/broadbeans – you want them only gently cooked. When the rice is ready, turn off the heat, stir through the chopped herbs then allow it to sit for a few minutes before spooning into bowls. Remove the dandelions from the stalks and separate a little. 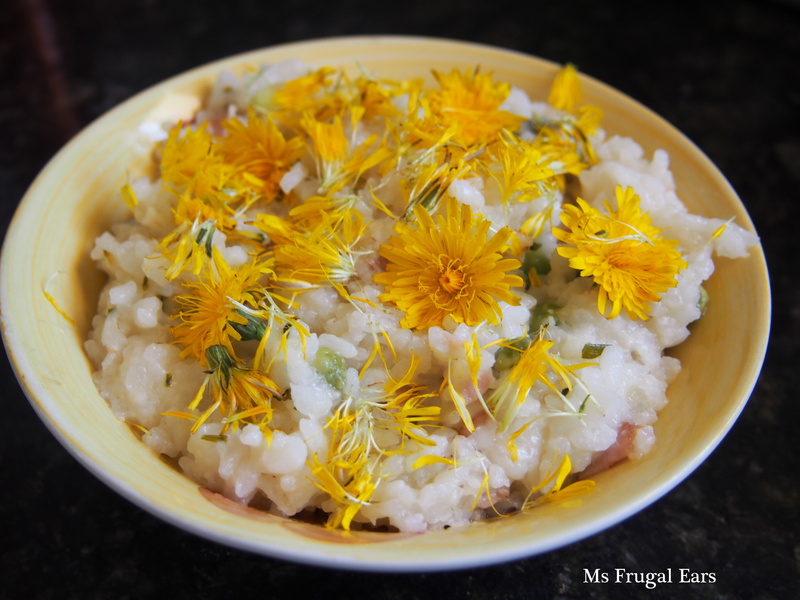 You can leave some dandelions whole – it is entirely a personal choice. Sprinkle on top of the rice. Serve while hot with Parmesan cheese. *Frugal hint. If you are on a tight budget, substitute Australian grown medium grain rice for the arborio rice. A restaurant chef will probably tell you this is wrong, wrong, wrong. But Australian grown Japonica rice is amongst the best in the world, highly sought after by North Asian consumers. The grains are not quite as big and absorbent at arborio rice, but it is still quite good and works out cheaper. Ha ha, yes feels a bit like eating sunshine. The flowers have a slight nutty taste. I perhaps wouldn’t want to eat too many of them just by themselves, but paired with something else they are quite nice.